You might be familiar with shortened links from social media or email. They’re handy for keeping things tidy and within a character limit, but you can’t see what you’re clicking on. What if the link is malicious or just a waste of time? 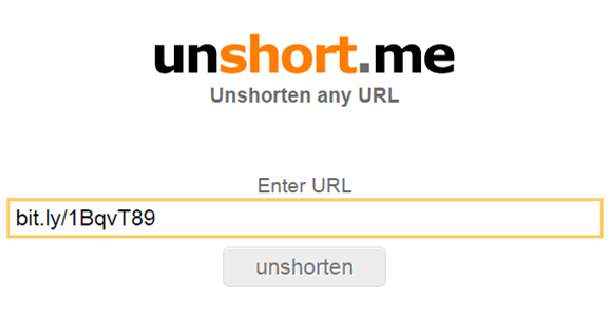 Turn that short link into a long link with unshort.me and see where you’re going. Copy and paste the short URL into the text box, and the site will expand it for you. A Chrome extension is available, allowing you to right-click and unshorten any short link you see on the web. Conversely, you may want to shorten links, either to make a character limit or clean up an email. For instance, the URL or link for the 2012 Law Practice Management & Tech Tips for Lawyers program is http://www.chicagobar.org/source/Meetings/cMeetingFunctionDetail.cfm?section=Calendar&product_major=C8215W&functionstartdisplayrow=1. Instead, to get to the same webpage you can shorten the link with Bit.ly to: http://bit.ly/1EaKaU7. The first link is long, can’t really be read to someone, it breaks onto a new line, and is cumbersome. Bit.ly neatens it up. There are many URL shorteners available for free on the web, such as ow.ly, goo.gl, and the originator of this technology, tinyurl.com, but Bit.ly has some really useful features. It has browser plugins for all major browsers so it is always available in one click. You can also add notes to the link, create link bundles (see: http://bitly.com/bundles/catherinereach/3), create private links, share via email in one click, and also track whether people have clicked on the link. Finally, you can customize the link so the above Bit.ly link (http://bit.ly/1EaKaU7) can be: http://bit.ly/2015techtips.